Jerry Angelo is the General Manager for the National Football League's Chicago Bears. He has held the role since 2001. Prior to joining the Chicago Bears, Angelo spent 14 years overseeing Tampa Bay Buccaneers' scouting department as their Director of Player Personnel. Angelo graduated from Miami University in 1971. Jerry Angelo has brought a clear vision to Bears football after guiding Chicago to three division championships since joining the team as general manager prior to the 2001 campaign, culminating in the team's 2006 NFC Championship and the organization's first Super Bowl appearance in 21 years. During the 2010 offseason, Angelo coordinated one of the biggest free agent acquisitions in franchise history, signing five-time Pro Bowl DE Julius Peppers. On the same day, Angelo also helped acquire RB Chester Taylor and TE Brandon Manumaleuna. During the 2009 offseason, Angelo orchestrated one of the biggest trades in NFL history, acquiring Pro Bowl QB Jay Cutler from the Denver Broncos. Meanwhile, rewarding core players, building through the draft and managing the salary cap are the cornerstones of Angelo's direction. His plan has created stability in Chicago and generated hope as the Bears continue to build upon a strong nucleus of talent. Chicago has three division titles over the last nine years, ending an 11-year drought in Angelo's first season in 2001. Angelo's tenure has yielded an overall regular season record of 76-68 (.517), plus a 2-3 postseason mark. Under Angelo's watch, Chicago is tied for the third-most regular season wins in the NFC and tied for 11th-most in the NFL over that same time. The Bears 47 wins in the past five seasons are third best in the NFC and tied for seventh best in the NFL. Angelo's mantra during his tenure in Chicago has been "reward your own" and he has followed through by taking a proactive approach with the team's key players. In 2009, Angelo extended the contracts of Cutler and DL Israel Idonije. The previous year, Angelo extended the contracts of 10 players, including Pro Bowlers Lance Briggs, Robbie Gould, Tommie Harris, Devin Hester and Brian Urlacher. Other Pro Bowlers to receive contract extensions since Angelo's arrival include Olin Kreutz and Nathan Vasher and nearly 60 percent of the Bears 2010 roster is signed through the next two seasons (not including the five 2010 draft picks). The draft, the primary means of bringing new talent to any NFL team, has been accentuated under Angelo. The efforts of his scouting staff have been highlighted after each of the last five seasons as five Bears players drafted by Angelo have received Pro Bowl selections: Lance Briggs (drafted in 2003), Tommie Harris (2004), Nathan Vasher (2004), Devin Hester (2006) and Johnny Knox (2009). Briggs has been selected to five straight Pro Bowls. Harris was selected to three consecutive Pro Bowls from 2005-07, Hester was named to two straight (2006-07) after becoming Chicago's first rookie Pro Bowl selection since 2000 (Brian Urlacher), Knox was selected to the Pro Bowl after his rookie season in 2009, while Vasher played in the Pro Bowl following the 2005 season. Angelo's seven drafts prior to 2010 produced an aggregate total of 23 rookie starters combining to make 159 starts: 38 in 2003, 30 in 2004, 33 in 2005, 15 in 2006, 14 in 2007, 16 in 2008 and 13 in 2009. Managing the salary cap is a key element to maintaining a team's continuity and providing the ability to sign talent through free agency. Angelo and his staff have excelled in this area allowing the Bears to attract key contributors through the free agent market each off-season of his tenure. The Bears current roster bolsters such free agent acquisitions as 2009 starters DT Anthony Adams (UFA - 2007), S Josh Bullocks (UFA – 2009), TE Desmond Clark (UFA - 2003), G Roberto Garza (UFA - 2005), OL Frank Omiyale (UFA – 2009) and T Kevin Shaffer (WFA -2009). Players such as Ruben Brown (LG), Thomas Jones (RB), Ricky Manning, Jr. (CB), Fred Miller (RT), Muhsin Muhammad (WR) and John Tait (LT) were also free agent pick-ups that started for the NFC Champion Bears in 2006. In addition to the draft and free agency, Angelo and his staff have also found contributors via the waiver wire, opponents' practice squads and other football leagues. Chicago acquired Pro Bowl special teamer Brendon Ayanbadejo and DE Adewale Ogunleye, who were key contributors during the Bears Super Bowl run in 2006, via trades. Angelo's personnel department has found key contributors that were waived by other teams such as Pro Bowler Robbie Gould (K, 2005), Hunter Hillenmeyer (LB, 2003) and Jason McKie (FB, 2003). LB Nick Roach and WR Devin Aromashodu were signed by the Bears off of practice squads of other NFL teams. Angelo has also guided the Bears to success in acquiring talent outside of the NFL, signing Rashied Davis (WR) out of the Arena Football League in 2005. Continuity in the Bears football operations was solidified in the 2004 off-season when Angelo hired Lovie Smith to be the 13th head coach in Chicago Bears history. Angelo and Smith spent five years (1996-2000) together in Tampa Bay, helping build a team that went on to capture a Super Bowl championship in 2002. Angelo created long-term stability for the Bears during the 2007 offseason when he signed Smith to a contract extension through 2011. In his first season leading the Bears football staff, Angelo helped guide the team to its first division title in 11 years. 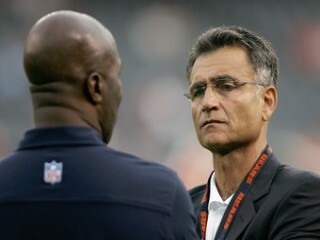 He was handed the reins of the Chicago Bears football operations on June 12, 2001 as the team's first general manager since 1986 (Jerry Vainisi). Angelo has 41 years of football experience, including 21 as a NFL scout and 23 in the NFC North Division (includes 15 years in former NFC Central Division). He oversees the Bears entire football staff including football operations, personnel and coaching along with all decisions regarding the draft, free agency, trades and the salary cap. Angelo accepted his current post after spending 14 years overseeing Tampa Bay's scouting department as the Buccaneers' Director of Player Personnel. In Tampa, Angelo helped turn a team that averaged under five wins a season in its first 21 years of existence into a perennial playoff contender, as the Buccaneers averaged almost 10 wins over his last four years with three playoff berths and one NFC Championship appearance (1999). The Youngstown, Ohio, native was a key member in carrying out the philosophy of Tampa's rebuilding process. He contributed to drafting nine Pro Bowlers with the Bucs and was pivotal in recruiting free agents Hardy Nickerson, Jeff Christy and Randall McDaniel, all of whom made trips to Hawaii donning a Bucs uniform. Angelo had a hand in Tampa's 32 Pro Bowl appearances by 14 different players from 1989 to 2000. Prior to joining Tampa Bay in 1987, Angelo spent five seasons (1982-86) as a regional scout for the New York Giants, including their Super Bowl XXI campaign. He spent 1981 in the Canadian Football League as the Calgary Stampeders linebackers coach. Angelo broke into the NFL as a scout for the Dallas Cowboys in 1980. After playing defensive tackle for three years (1968-70) at Miami of Ohio for coaches Bo Schembechler and Bill Mallory, Angelo graduated with a bachelor's degree in social sciences and a master's in secondary administration while working as a graduate assistant at the university in 1971. He went on to coach eight more years in the collegiate ranks beginning at Colorado State as a part-time defensive line coach (1972) and ending with a five-year stint as the D-line coach at Syracuse (1975-79). In 1973 and 1974, he served as the defensive line coach and recruiting coordinator for the University of Tampa before the Spartans cut the football program. Jerry and his wife, Bernie, have two daughters, Leisa, who is married to Brad Rice, and Sutton. View the full website biography of Jerry Angelo.